HOUSTON, TX — Tony Díaz recalled the kinds of comments he would get when almost two decades ago he proposed creating an organization in Houston, Texas to showcase and promote the work of Latino writers. “What? Latino literature? Latinos in the United States are not into that. There’s not enough interest. There just aren’t enough Latino writers. A book reading? You can read it at home,” said Díaz, a college professor, remembering past conversations. “I had a pretty good idea of what it should be, but I was hoping someone else would start it,” he said. But no one did. For Díaz, the straw that broke the camel’s back was when he attended a book signing of acclaimed Puerto Rican writer Esmeralda Santiago and only five people showed up. It was then that Díaz, the first Latino to obtain a Master’s of Fine Arts in Creative Writing from the University of Houston, took action. Thus, “Nuestra Palabra: Latino Writers Having Their Say” was born. Celebrating its 18th anniversary on April 27th, “Nuestra Palabra” as it is known, has morphed into a factory of culture accelerators. The non-profit organization now includes book readings, a weekly radio program, book fairs like the Houston Latino Book and Family Festival, workshops for teachers and speaking engagements. In other words, “Nuestra Palabra” is an organic, centralized place where writers, readers and Latino activists can exchange ideas. 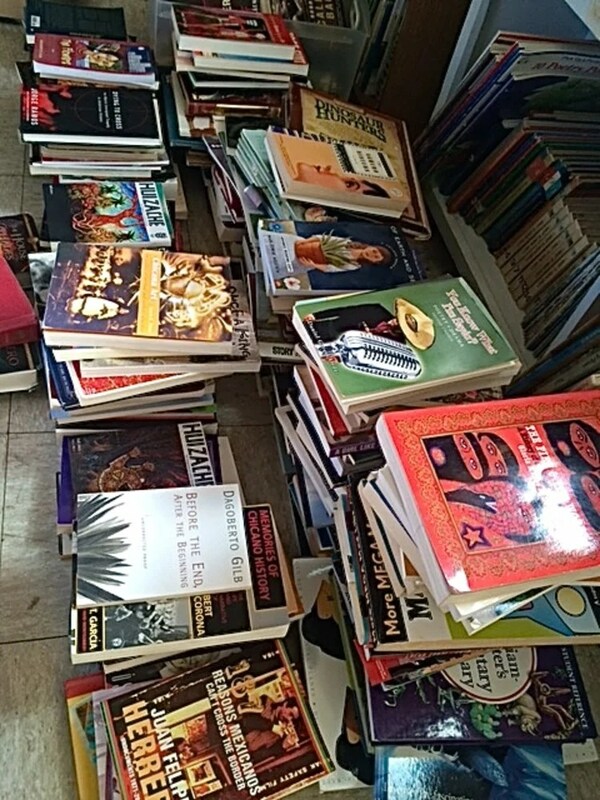 The organization also made national headlines with “Librotraficante,” a caravan organized by Díaz and the group that started transporting books from Mexican-American authors with Latino themes into Tucson, Arizona, after the 2010 law that banned Mexican-American studies in public schools. 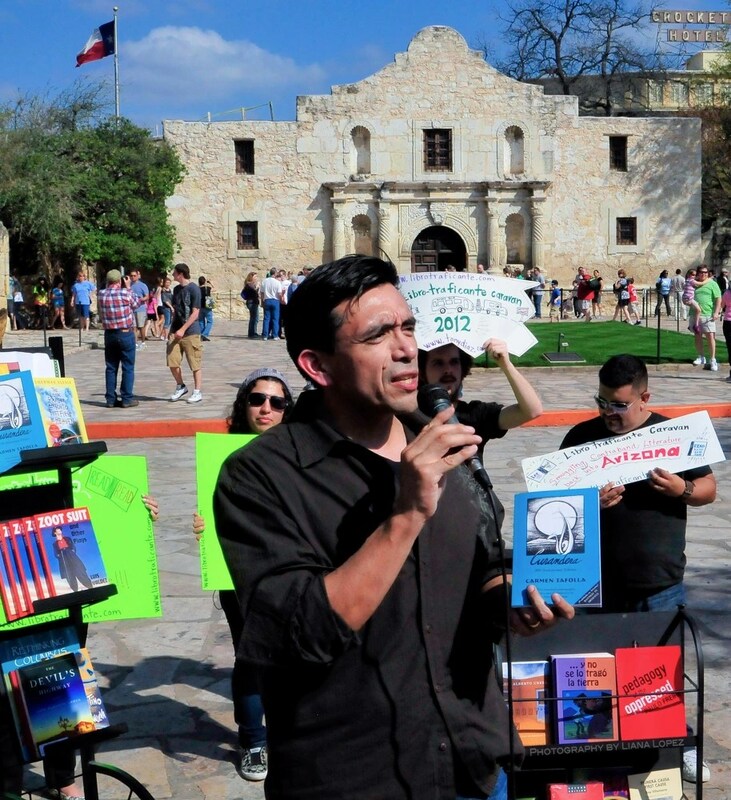 File photo of Tony Diaz during a “Librotraficante” rally. “Some people think we are a poetry open mic. Some people think we are librotraficantes. Some folks who listen to our radio show are surprised to find out about the live events. We are a little bit of all of that,” reflected Díaz. In the past 18 years, when countless non-profit organizations have died because of a lack of resources, Díaz attributes the sustainability of “Nuestra Palabra” to the fact that it is not run like a business. The organization, as he describes it, operates with a model that is organic and with community support. “Everything that our community once did to survive, we now use to thrive — we are used to adapting and performing several jobs at once,” he said. Proof of this is the greatly successful annual book fairs and family festivals organized by “Nuestra Palabra,” which have been attended by thousands of people. In a world where “brick-and-mortar” bookstore chains have ceased to exist, “Nuestra Palabra” has survived. Keeping up with the times, the organization is now looking to create and launch its own computer app, called Latino Literary App. The 18th anniversary of “Nuestra Palabra: Latino Writers Having Their Say,” plans to feature a showcase lineup of several Latino writers in Houston, and the pledge to develop future innovative initiatives that promote Latino literature. Times have definitely changed since Diaz first proposed his idea 18 years ago. Not only has Latino literature seem to have found its place in the community, but those who create it have, too. To learn more about “Nuestra Palabra: Latino Writers Having their Say” visit www.nuestrapalabra.org.